They call him the “brother” of Punxsutawney Phil. But in reality he’s a trussed-up travesty procured from Miss Pixie’s vintage store. For the second year in a row, the District will trot out this dog and pony show–or should we say groundhog and pony show?–for its supposed metereological delights, the Washington Post reports. At the District’s second annual Groundhog Day celebration, “Potomac Phil” will look for his shadow in Dupont Circle Saturday morning to determine how long winter will last. 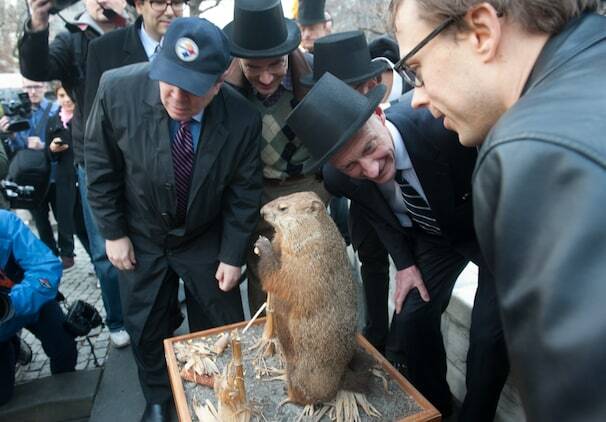 According to legend, if one of the Phils — be it the real-life Punxsutawny or the taxidermied Potomac — sees his shadow on Feb. 2, winter will last six more weeks. Last year, “Potomac Phil” (if that is his real name) predicted six more weeks of winter and nine more months of Congressional deadlock. This year, we hear that once again there will be fortune-telling. This being Washington, Potomac Phil is also expected to make political predictions, organizers said. But not everyone is fooled by this chicanery. Media hyperbole has raised the public’s hopes. They anticipate accurate weather forecasting and inside-the-beltway political knowledge in these uncertain times, depend on it even. The predictions are slated to be the main event in a morning of celebration, which will include live accordion music and polka dancing. Look, I’m down with the cookies. But only a real, live groundhog can make accurate predictions. And what of “Potomac Phil,” forced to be the subject of this mockery? Groundhog Day in the Nation’s Capital should be a bellwether event, not a farce. We need a real National Groundhog. Too many people’s lives and livelihoods depend on it.